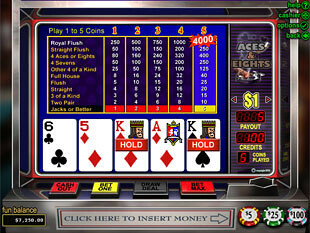 SlotsPlus Casino is one of the top 100 online casinos that takes great pride in the video poker set of games as well as in the incomparable collection of slot machines, card and table games. The team of this gaming house is totally committed to excellence and is familiar with every nuance of the player’s wishes. So, Slots Plus Casino guarantees you complete satisfaction. 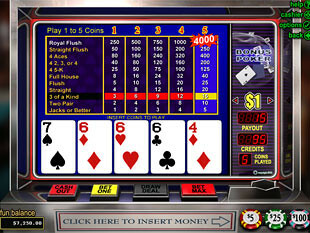 You can be absolutely sure that game results are fair because this casino uses RNG (Random Number Generator) that generates randomness by selecting random numbers every millisecond, so it is really impossible to predict how the game will unfold. 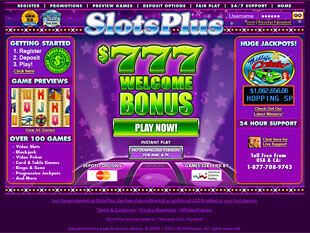 The best casino promotion is $777 Welcome Bonus. All you need to get it, is to download free casino software, register Real Money Account and make a deposit minimum of $20. This promotion implies 40x wagering requirement. Every new casino member should take advantage of 125% First Deposit Bonus. Just make your first deposit of $20 or more and up to $125 will be credited on your account. Deposit more than 100 and you will receive $125 Free on your first $100 of your deposit and 25% on the rest part of your deposit. In addition you can get 25% Bonus if you use MSTGift Card while making a deposit. You should remember that this bonus implies 40x wagering requirement (80x for video poker). All frequent players can get $100 Weekly Reward. This bonus is given randomly. Each week casino gives 10 prizes of $100 Free Cash. To get to know how to become eligible for this bonus, contact casino custom service. 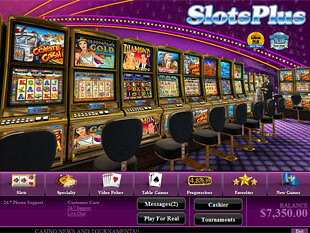 You can also participate in casino Loyalty Program. Every time you wager, you accumulate Comp Points that you can exchange for real money. You also will be automatically qualified for Silver, Gold, or Platinum Level Bonus. Note that this bonus can imply wagering requirements. If you want your friend to join the casino, you can combine business with pleasure and get $20 Refer a Friend Bonus. You will get this bonus on condition that your friend deposit $50 and send e-mail to support@slotsplus.eu. Note that you should meet 40x wagering requirement. 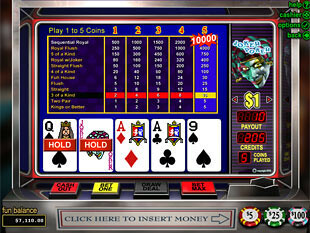 SlotsPlus Casino Casino offers a rich diversity of games, especially Video Poker games: Bonus Deuces Wild, Bonus Poker, Bonus Poker Deluxe, Deuces Wild, Double Bonus Poker, Aces and Eights, All American Poker, Joker Poker, Jacks or Better, Seven Stud Poker, Sevens Wild etc. 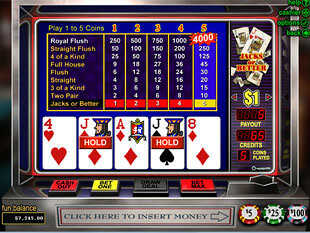 RTG has created 2 casino formats – download and flash. Flash format gives you fast and easy access to the casino games, so you can connect SlotsPlus Casino casino whenever you want it. To be more exact, flash format is good if you have no possibility to install the software. But download version is better because it contains the full game collection. Besides, it is completely free and installs in seconds. Thanks to the following electronic payment methods all monetary transactions will be fast and secure: Visa, ClickandBuy, Instadebit, Moneybookers/Skrill, MTSGift Card, Neteller, Money Order and others. It is very important that you can make deposits in any currency.